There has been much written regarding the events of 11 September 2001. This article is yet another piece of thought to give rise to more thought, thought involving the numerological effects of that day from yet another numerologist's perspective. The Towers tragedy and events such as these, as sad, unfortunate and horrific as they are, nonetheless give us excellent opportunities to study the numerological effects of cosmic energies in our lives. These kinds of occurrences, of course, are not normal and it is precisely this abnormality that gives clarity to our 'cosmic vision' because the energies involved stand out so dramatically. Tragedies such as the Towers' Attack have causes. Nothing in this universe is without cause, and while we are ignorant to know the divine master plan for such happenings, we can still analyze, to the best of our ability, their associated number patterns in order to help us decipher the energies associated with them, thereby gaining greater understanding of how numbers and their energies manifest themselves. We may never know the whole picture, but we can gain valuable clues to numbers and their relationship to our lives by thoroughly studying prominent events when they occur. The same can also be done for prominent people and things. The dominant numerological energies associated with the terrorist attack on the United States of America on 11 September 2001 are these: the number 5 and its 14 binary root; the number 2 and its 11 binary root; the number 7 and its 16 root. The numbers 3 and 8 also play roles, but while significant, are not as major. These numbers (2-5-7) were massively intense on that particular day. Their overwhelming admixture could spell nothing but disaster, tragedy, loss and spiritual counterpoint for America. A note before we continue: in numerology every number has two aspects - positive and negative, just as a coin has two sides. Furthermore, it is important to understand that when we hold a coin, we hold both sides of that coin and it is impossible to not hold both sides. We can't hold just the positive side. In other words, in life we walk with both the positive and the negative at all times. It is our choice as to which side of the coin, which aspect of positivity or negativity, we choose to express. Generally, normal events have normal energy patterns. Abnormal events have abnormal energy patterns, such as those in this case. The more compounded specific energies are at a given time determines the extent, degree and intensity of their expression. For example, during this American tragedy, the number 5 was positioned in nine major places generating an enormous amount of heat, energy and pressure for that day. The results of which could not but be painful and heart wrenching.. In numerology, the number 5 (a fire sign) represents freedom, change, detachment, loss, movement, motion, exploration, experience, diversity, variation, sensuality, non-conventionality. One of the dominant roots of the number 5 is 14, the binary cipher representing physical loss and detachment. Why? Because the dynamic initiating energy of the 1 embraces the physical and structural energy of the 4 creating new structures. In this process change is the natural product. It's out with the old and in with the new. Furthermore, where there is change, there is obvious loss and detachment. When there is detachment, there is generally pain and suffering. As all mystics teach, attachment is the root of all suffering. Where there is no attachment, there is no suffering. Until we are spiritually advanced and divinely detached from the world, we will always suffer. In the coin of this realm, sadness, pain and loss consist of one side while happiness, ease and gain occupy the other. Remember, we cannot hold a coin without holding both sides simultaneously. Such is life in this dimension. What is critical to all this is that the Lifepath of the United States of America is a 5 vibration. Its Specific Root is a 32; its Transition Root is a 14. The Lifepath is calculated from the birth date: 4 July 1776 ( 4 + 7 [July] + 1 + 7 + 7 + 6 = 32 > 3 + 2 = 5). When each component of the birth date is reduced to a single digit, the 14 binary root appears ( 4 + 7 + 3 [1776 reduced to a single digit is 3] = 14 > 1 + 4 = 5). In Numerology the Lifepath is the script of the entity's life. It is the text of the play, the focus of the drama. It also addresses the lessons to be learned, both positive and negative. Since the Lifepath of the United States of America is a 5, she will be acting out the script and involved in the drama of freedom, change, diversity, loss, detachment, etc. Interestingly, what is the one word associated with the USA? Freedom. She is also regarded as a melting pot of many diverse peoples, religions, cultures, races. The 5 Lifepath of the United States of America is the first thing of note in the Towers' tragedy. Second is that the Universal Day for the world, the eleventh of September 2001, is also a 5 day ( 11 + 9 + 2001 = 23 > 2 + 3 = 5). When the numbers in this date are reduced to single numbers and added together, the 14 Transition Root appears ( 2 + 9 + 3 = 14 > 1 + 4 = 5). Loss, detachment, change of structures are brought into focus. Therefore, the U.S. had to be affected on this day, as on every 5 day to some degree, because her 5 Lifepath aligns with the universal day's energies, a 5. However, this alone is not enough to create havoc for the U.S. After all, every nine days there is a 5 day because numbers follow a nine digit cycle. We must press on and look further in our search to find answers to this tragedy. What we're looking for is a compounding of 5 energy, a numerical 'stacking' which would generate enough power to create the intensity of that event. Third is that the Personal Year of the United States of America for 2001 was a 14/5. The Personal Year in numerology is found by adding the day and month of birth (4 July for the U.S.) to the current calendar year. Therefore, the equation is this: 4 + 7 + 2001 = 14/5. This major Personal Year energy means that America's lessons for the year will focus on freedom, loss, detachment, etc. Note that this is also her Lifepath lesson, as well as being the Universal day's energy cipher! This is a major piece of evidence because the Personal Year is a dominant wave of annual energy depicting lessons to be learned and issues dealt with during its twelve month annual cycle and . . . the Personal Year energy begins to generate a 'stacking' of like-kind energy - evidence of ensuing intensity. Fourth. The Personal Month of the U.S. is also a 14/5! Stacking has now become dominant. Any time the same numerical vibration is compounded at least four times in a chart during a specific time period there is stacking. Stacking creates intensity, positive or negative. The results are always intense. The Personal Month is deduced by adding the Personal Year's energies to the calendar month. The Simple 5 Personal Year of the U. S. is therefore added to 9, the numerological cipher for September, generating another 14/5 ( 5 + 9 = 14/5). Five is the vibration of change, loss, motion, movement and freedom. This quadruple stack of 14/5 vibration would spell horrendous change in anyone's chart. It is a massive amount of energy. This could not have been a day of stability for the United States. This amount of 5 energy is like an earthquake whose rumblings are sufficient enough to level the strongest of buildings, which it did, or a giant tsunami whose massive waves of mountainous motion overpower and crush all in its wake. Remember the photo of people running for their lives with a tsunami-like wave of smoke and ash barreling down on them through the skyscrapered streets of New York? Still, there is more. Fifth. The Material Soul energy of the United States maintains a 14-5 transition root. Her Natural Soul energy (derived from the vowels in her name), that vibration identifying her needs, wants and desires, is a 9. This 9 Natural Soul energy means America has an intrinsic need and desire to serve humanity, be generous and benevolent, to be the universal brother, to be powerful, if not dominant; to rule. When this Natural Soul energy is added to her 5 Lifepath, the result is her Material Soul, likewise a 14-5 vibration. The Material Soul cipher explains how the Natural Soul energy will manifest itself. In this case, the desire of America for universality, power, benevolence and rulership plays itself out in the arena of freedom, the core of what drives America. This is a significant piece of the Towers Tragedy puzzle because the attacks hit America where she would be hurt the most . . . in her heart. As every sphere has a core, so does every living being and thing. For America, her core is universal freedom for all people. This is what motivates her and gives her life meaning and joy. By attacking her core, her need and desire for freedom, her enemies attacked her heart, the center of her life blood. Sixth. The Expression (that vibration derived from the name) of the World Trade Center, is a 5, with a 14 Transition Root. The Expression is that component of a numerology chart which identifies the person or entity with all of its characteristics, assets, liabilities and potentials. The Expression can be likened to an actor whose job it is to perform the script, the Lifepath. Because the WTC's Expression is a 5, it was a hub of freedom itself - diverse, dynamic, active, moving. It was also, therefore, a primary structural appendage of America's own 5 Lifepath and 5 Material Soul. As a side note, the Natural Soul energy of the World Trade Center is a 22, the master builder cipher designating power and wealth. This desire for material success was at the core of the WTC. It was the basis of its needs, desires and motivations. Seventh, the Realities. The Reality cipher in numerology is also called the Performance-Experience cipher in The King's Numerology system because it designates that which the person or entity will experience as a result of his personal Expression energies combining with Lifepath and yearly transiting energies. The Expression cipher of the United States of America is a 3. The Expression is derived by adding together the numerical value of each letter in the full birth name and reducing to a single digit, a calculation excluded here. When this 3 is added to 11, the day of the attacks, the result is once again a 14/5! This means that as a result of the influence of others (11/2), the result America will experience will be loss and change. This is yet another major numerological puzzle piece of the Towers Tragedy and intensifies the stacking principle. Eighth, the Pinnacle/Reality energy. Pinnacles are time periods in a numerology chart. They are derivatives of adding the day, month and year of birth together in varying sequences. The First Pinnacle is the sum of the day and month. Thus, 11 (the day of the attack) added to 9, the month (September) = 20 or 2 in reduction. This 2 added to the 3 Expression of the United States is another 5. Almost exhausting, isn't it, all these 5s! All this motion! All this detaching! All this loss! All this change! Ninth, the Challenge/Reality energy. This energy is derived by subtracting the components of the natal data. In this case, the First Challenge of 11 September 2001 is also a 2 (11 [the day] minus 9 [the month] = 2). Again adding the 3 Expression of the U.S., a 5 is the outcome. This stack of 5 energy, most of which includes 14 energy in transition, gives us an extremely clear idea of the events of 11 September 2001, as far as the U.S. is concerned. As a professional numerologist, I have personally never seen such a concentrated amount of energy in a chart until this incident, and on a personal note, my own Expression and Lifepath are both 5s, so I thoroughly am acquainted with and understand the functional realities of these energies and what they do to one's life, whether that life belongs to a person, being, place, event or thing. Where there is a concentration of 5 energy nothing remains static. There is constant change, constant movement, constant loss, constant detaching. It is an extremely dynamic energy whose purpose is to detach, liberate and free. Tenth. Just to toss in one more note, Al Qaeda, the terrorist organization involved in the attacks also carries a 5 Expression! In summary, below is a list of 5 energy components involved in the Towers' Attack.. Yet, there is still more relating to the already overwhelming abundance of 5 energy previously discussed. The Lifepath of 11 September 2001 is, as we've seen, a 5. However, as we look deeper into its chart, we see that not only is 11 September 2001 a 5 day, but its Grand Pinnacle, the core of its life and its Crown Pinnacle are also 5s! See the chart below. The Grand Pinnacle is derived by adding together the final product of the components of the day and month (2 + 9 = 2) and the month and year (9 + 2001= 12 > 1 + 2 =3), then > 2 + 3 = 5. This Grand Pinnacle cipher is the only cipher in any chart which is a total admixture of the day, month and year. Hence, it represents the core of the Lifepath and is called the Grand Pinnacle. The Lifepath of 11 September 2001 is a 5, and the core of its being is also a 5! Very potent, indeed! Still there is more. The Crown Pinnacle of 11 September 2001 is also a 5! It is a derivative of adding the day (11) to the year (2001). 2001 + 11 = 2012 > 2 + 0 + 1 + 2 = 5. The Crown Pinnacle rules the activity during the later years of the lifepath and can be said to be that energy into which all the other energy will eventually flow. The result: 11 September 2001 is a day whose Lifepath is saturated to the core with the principles of freedom, change, loss, diversity, detachment, experience. It is a multi-facet Lifepath involving mankind in general. Its Challenges, the 19/1s on the underside of the pattern above signify that individuality, sovereignty and independence will be tested within the course of the life. Interestingly, this will be the chart of any child born on that day as well. What does all this stacked 5 energy mean? Issues of freedom, change, loss, detachment, exploration, experience and people in general will be hugely affected. Furthermore, the lessons the United States of America is to experience because of her 5 Lifepath will be dramatic on this day, this 11th of September in the year 2001, and her heart - that which pumps the lifeblood of freedom through the entirety of her very being, will be pierced. Obviously, America was greatly and intensely affected on this day, inundated with issues and realities related to freedom, loss and change - the prime theme in the script of her life and the desire of her heart so much so that no living person will ever forget this hallmark event. Only death, perhaps, will rid us of the memory, the horror, the terror, the tragedy, the heartache and heartbreak of 11 September 2001. All this 5 energy played an extremely vital role in this event, but it is not all there is to know and understand regarding the numerological aspects of that fateful day. There is more. The number 2, the passive polarity in converse to the active 1 polarity, represents 'others' in numerology and everything that deals with the yin, the female aspect of creation. It also represents partnerships, relationships, togetherness, duality, polarities, opposites: balance and imbalance, relaxation and tension, war and peace, back and forth, up and down as reflected in musical beats and so forth. In its negative polarity 2 represents those energies of opposition, competition, contention and confrontation, a clashing of egos. In its positive aspect 2 is extremely supportive, kind, caring, gentle, passive, peaceful, cooperative, helpful, assisting. The number 1 is generally regarded as direct and decisive. What you see with a number 1 is generally what you get. The number 2 is generally regarded as being indirect and indecisive. What you see is not always what you get. The 1 works out front. The 2 works behind the scenes. A 2 person, for example, may appear passive, but if supported by an 11 root, there is fire stirring underneath. For example, there is a saying that sergeants run the army. Generals do, don't they? Yes, but it is sergeants (in a support role ) which carry out the orders and get the job done at ground level. So it is in the business world with secretaries and personal assistants. They are ruled by the supportive, 'passive' 2 energy, but where would the business world be without them? In the same vein, secretaries and personal assistants run the business world. Neither sergeants nor secretaries are passive. They are supportive, but extremely active in that support role. That's why the number 2 cannot be regarded as totally passive. Let's see more. The number 2 has ten binary roots, as do all single numbers. The binary roots forming the number 2 are: 11 - 20 - 29 - 38 - 47 - 56 - 65 - 74 - 83 and 92. Interestingly, 9 of these binary roots first reduce to an 11 in transition before further reducing to a singe digit 2 cipher. In other words, when the single digits of the root are added together, the result is an 11. For example, 8 + 3 = 11, just as 7 + 4 = 11, and so forth. This means that 90% of 2 energy maintains a dynamic 11 vibration within its being. The only truly passive 2 is derived from a 20 binary root. All the other 2s have double fire within them, which is why in The King's Numerology system, the 11 is referred to as the master achiever vibration. Many successful people have 11 dominant in their charts. It is the fire contained within the 11 root of the 2 that gives it hidden active power. The number 11, which obviously played a major role in the Towers Tragedy, is a master number of elevated, dynamic energy. It reduces to a 2, of course. In its pure state 2 is a passive number, but 11 is anything but passive. The outer appearance may be passive, but the underlying foundation is rooted in a double 1, a fire sign - dynamic, energetic, assertive, creative, independent. The number 11 is the product of two 1s. It is dynamic fire playing itself out in the field of the yin, of others, balance, support, opposites, opposition and so forth. The number 11, because it is filled with so much energy, always brings tension (positive or negative) of one sort or another in a chart. In one sense 11 can be seen as two ones in juxtaposition - two separate individuals, two separate egos, two separate philosophies, concepts, points of view, countries, groups, teams, etc. merging to form one vibration. It's almost like Siamese twins - two people encased in one form. The number 11 can also be seen as it is: parts of a whole, the whole number 2. In this construct the 1s may be harmonizing in agreement or clashing in disagreement. Both 1s may be traveling in the same direction or moving in opposite directions, vertically or horizontally. They could be holding hands or bumping heads. They could create perfect peace if in harmony or total war if in disharmony, the latter occurring if the negative aspect of the 1, the ego, prevails over its positive aspect, divine union or yoga. The first note regarding the 2 in regard to the World Trade Center assault is that the world is now in the Second Millennium, a thousand year period representing the yin, the female negative aspect of the Tao, partnership, togetherness, others, balance, conflict, and so forth. The emergence of individual (1) nations, which occurred during the first millennium, has now given way to the principle of cooperation, partnership, and others (2), not the self (1). The people of the world must now learn to get along, to share and to work together (2) if they wish to create peace and balance on the earth. The world must now learn to integrate its separate parts, its separate entities, its separate 1s into a paradigm of 2 partnership, togetherness and cooperation. Until it can do this, it will suffer under the clashing of its multi-faceted ego. The enormous wave of 1 energy which was the first millennium is now gone. The world is riding the wave of the 2. The theme for the next thousand years is others, partnership, relationship, togetherness, cooperation. If there is kindness, caring, support, assistance, softness and consideration of others and their needs, there will be balance and ensuing peace. If there is unkindness, uncaring, non-support, non-assistance, harshness and a consumption with self, there will be imbalance and its natural by-product - instability, war and conflict. For a more detailed explanation of the second millennium, please read the article, Millennium 2000, at www.richardking.net/article1a.htm. Also of interest in this regard is the article, Princess Diana, Millennia Bridge (article1b.htm). A second major factor regarding the number 2 is that the calendar date of 11 September 2001, maintains 2 in the first three positions of its chart. 2, in varying form, represents the first Epoch, first Pinnacle and first Challenge of that date, a rare combination. See the chart below. In the above diagram, 11 (the first Epoch) is the day, 9 represents the month (September); 20/2 is the first Pinnacle (derived by adding 11 and 9); 2 (on the bottom) is the Challenge (derived by subtracting 9 from 11). Every 11th of September will have this arrangement, but the calendar year will change, thus creating a different Universal Year which is the sum of the day, month and year. However, only once in recorded history will this day/month combination be attached to a 2001 configuration, a configuration in which 2, representing the second millennium, embraces new beginnings (1). That day, of course, is 11 September 2001. The 2001 energy means there will be new occurrences (1) in the realm of others (2) within its twelve month cycle. These energies and their issues will come to fruition and be highlighted during the ninth month, September, representing endings, conclusions, finalities, resolutions. Certainly the insidious nature of terrorism became truly global on this day, and the world became irrevocably changed (5) on 11 September 2001. So what is the significance of the number 2 in relation to the Towers Tragedy? As there was a huge stacking of 5 energy related to freedom on 11 September 2001, there was also this internal triple stacking of 2 energy within the date of the event representing the concept of others, relationship, partnership, conflict, contention, opposition and war (the negative aspect of the 2). This internal triple stack of 2 energy, of course, is contained within the framework of the 2001 cipher. There is more to note regarding the 2 energy. The Expression of Osama bin Laden is a 2! His roots are 11 and 47, the latter depicting intelligent energies of structural (4) analysis (7). While this name may not be his actual birth name, it is the name with which the entire world identifies him. Coincidence? Not from a numerological perspective. Nothing is coincidental in this world. There is a divine design to all things. Furthermore, it has been written that Osama bin Laden is somewhat of a shy person. This would correlate with his 2 basic Expression. However, we must remember that he maintains an 11 (double fire) root in this 2 crown cipher. This 11 springs from the binary 47 which always represents intelligence, especially within the field of form, order, structures, plans, frameworks, work, effort, diligence (4) as all these ingredients encompass the mind, thought and analysis (7). The 47/11/2 construct is a thinker's vibration. Many very bright individuals house this cipher grouping in their charts. Osama bin Laden, for all that he is, is an intelligent man. The year 2001 marked the 225 birthday of the United States of America. Note here the concentration of the numbers 2 and 5 again! The principles of Others and Freedom are once more highlighted. This 225 reduces to a 9 ( 2 + 2 + 5 = 9). Nine is the number of endings, completions. As this was America's age, it, too, represents a major thread in her year's life experiences. So what will end for her? America's Expression is a 3. Three is the cipher of self-expression, communication, ease of living, comfort, happiness, health, beauty, friendliness. That's what ended. Forever? No. But it is the energy she will experience for this year. It is part of her destiny. It will also be highlighted in March of the year 2002, her ninth cycle month. As we recall from earlier discussions, for the United States, her Lifepath, Personal Year, Personal Month, as well as the Universal Calendar Day (11 September 2001) all express a 5 cipher. Her personal Expression is a 3. When the 5 and 3 merge in addition, the result is an 8. We have not discussed this as of yet, but the number 8 rules material success and power. It is, in fact, the Role of the United States. (Expression 3 + Lifepath 5 = Reality 8). Therefore, with the concentration of 5 energy representing freedom, loss, detachment and change comes a reality for America on 11 September 2001 involving her personal material success and power which will be negatively affected. The World Trade Center was obviously a hallmark for that power, for the energies of commerce which the 8 represents. When the 3 Expression is subtracted from the 5, a 2 appears. A 2 again! Challenges with others, specifically and collectively; challenges with confrontation, collision, discord, competition, balance. Everywhere we look the same message keeps repeating over and over again. In numerology the letters of the name carry transiting energies and their accompanying characteristics. During the year 2001 (beginning on her birthday in July) and ending on her birthday in 2002, the United States of America will be transiting the last year of the 'm' of 'America'. 'M' is the 13th letter of the alphabet. It represents death, transformation and rebirth. This transit has been with her for the four year period beginning in 1998. Interestingly, America was transiting the same letter during successive years 1913 to 1916, the time period of the First World War. When this 13/4 energy is added to America's lifepath of a 5, the result is an 18/9, a result of endings( 13 + 5 = 18 > 1 + 8 = 9; hence 18/9). America's Specific Lifepath is a 32/5 ( 4 July 1776 > 4 + 7 + 21 [1+ 7 + 7 + 6=21] = 32 [3 + 2 = 5]. The 13 of M + the 32 Lifepath = 45/9. This indicates that structures, forms, frameworks, foundations (4) will undergo change (5) resulting in endings and conclusions(9). In simple terms, death and transformation(13/4) create endings(9) with this pattern. In the year 2002 (beginning in July), America will come under the transiting 5 energy of the 'e' in 'America'. The 5 energy of change will find itself manifesting in new beginnings, creation, individuality (1). This energy will continue for a period of five years until July 4th 2007. There will thus be changes for America, changes affecting her identity, her self. There will be new beginnings and much creative effort. Another interesting note is that when we add the 5 Expression of the WTC to the 11th , the result is also a 16/7 cipher. The chaos, heartache and heartbreak it felt is unquestionable. It's role on this day could not have been happy. No cipher brings more spiritual testing than the 16/7. And . . because the Pinnacle and Challenge were both 2s, the WTC was at high risk because it, therefore, had a triple dose of 16/7 energy! Too, remember Osama bin Laden's Expression is a 2. Therefore, when his energy is mixed with that of the WTC (5), the outcome is again a 16/7. The two simply create chaos together. There is no question that the events of 11 September 2001 created horrific and significant events for the world, as well as for the United States. There was terror; there was tragedy; there was death; there were broken hearts, broken dreams and tears . . . lots of them. There will be more no doubt. These kinds of wounds do not heal quickly. With all this tragedy it is sometimes hard to believe in a loving God. But we must remember that this is His Creation. He didn't just create life. He also created death. He didn't just create peace. He also created war. He created happy faces and sad ones. Who knows why? Only He does. It is therefore incumbent for spiritually focused souls to maintain their balance and equilibrium during these times and to see and act upon the positive side of the coin. Remember, all coins have two sides, and while there was tragedy for America on 11 September 2001, there was also good fortune. What was that good fortune? A quickening of the Spirit within each of us, a swelling of love, compassion, kindness, concern, tolerance, helpfulness, patience, onenss. Indeed, there was a searching for divine solace and understanding. It is a safe bet that the word 'God' was used more on that day by Americans than perhaps on any other day in its history. People turned their minds and consciousness to God for solace, comfort, direction, hope, peace, support. Were they doing that the day before? The week before? It is sad but true that most of us only remember God during times of heartache and tribulation. What would be the outcome if we remembered Him everyday with the same intensity and devotion? It is a fact that the heinous act of terrorism which created the Spires of Fire pierced America's heart, but in doing so what it also did was pierce her spirit and thereby awaken it, vitalize it, supercharge it - an incredibly huge miscalculation by her perpetrators. It's like kicking a sleeping lion in the side. 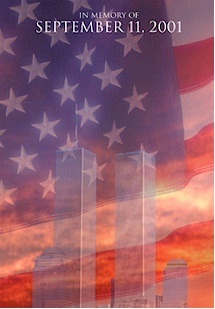 America's lifeblood and lifepath are freedom, and this day of all days was the day which harmonized with her very being. Yes, there was great tragedy, but the other side of the coin of such tragedy is an equal intensity of goodness, strength, courage, fortitude and resolve. When, for example, has any American in the modern age seen the level of altruism, patriotism and spirit expressed as it is being expressed now? Then there was a recommitment for freedom and liberty for all people. The entire sane world understands the importance of nullifying terrorism in order to create the global peace and equilibrium which this millennium represents. Some action, some condition had to generate that focus. 11 September 2001 did that. These events also intensified our consciousness of generating an active working partnership within the world. We can no longer afford to be an earth of isolated parts. In order to run efficiently, the parts of the world must synthesize to create harmony and a free flowing stream of goodness for everyone. It is not a world of the 1 anymore. It is definitely a world of the 2, of others, of partnership, of cooperation. It is a world where all the 1s need to learn to share, support and help each other. Such will be the focus of this millennium, and it got its jump start on 11 September 2001 with America's Spires of Fire.